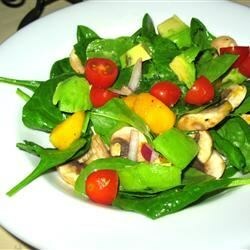 "All the fresh ingredients make this salad a great side dish or a whole meal by itself! The black pepper brings out the flavor of the mangos." I bought a bigger salad bowl so that I could make this salad again. I love the combination of mango and avocado - it tastes great and looks very colourful.